Because of poor connections to the outside world, it's a been a while since my last post so I'll get right to it and let you all know what's going on. However, before I dive into this, I want you all to know that I really appreciate your support on this hike. Without your thoughts and prayers I'm not sure I'd be in such high spirits a this point. Thank you for your excitement, your interest, and your willingness to read these words each week. You'd think that I'd know how to describe this experience properly now that I'm over 700 miles into it, but I can't. About the time I attempt to explain what it's like, I feel as though it's not enough and that I'm failing to describe it well enough. I actually get slightly choked up thinking about the idea of having just hiked all of southern California. Long miles and hot miles. This is more than a hike each day or the idea of walking to Canada. Sure, it's physical, but it's damn near more emotional than anything. The truth is, I have a desire to quit at some point every single day and the only thing that keeps me going is the knowledge that it's supposed to be this way. I have ailments that crop up every day and I often wonder if those pains will grow into a larger problem that will remove me from the trail altogether. Sometimes the negative parts of my psyche secretly hopes they will so I don't have to swallow the idea that I'm not even halfway to Canada. I know it's all mental so I continue my daily routine of waking up, eating a Honey Bun, hiking for two hour blocks, having lunch, hiking again, and making camp. Eventually, I make it to my intended destination and regroup for the following stint of miles. It's a grind, but there is beauty in it and I'm beginning to think that I'll never be able to properly express what this process is like. Threw rocks at this can for 4 hours. I made 5. So what's happened since my last post? I left Tehachapi and had a hard week. Connection to the outside world was limited and it had a huge impact on my overall mental state. Not being able to let Jess know that I'm okay was hard and not hearing her voice was even harder. You'd be surprised at how a simple text can motivate me through the day or the week and how without that text message it can make that week or day drag out to feel like a month. 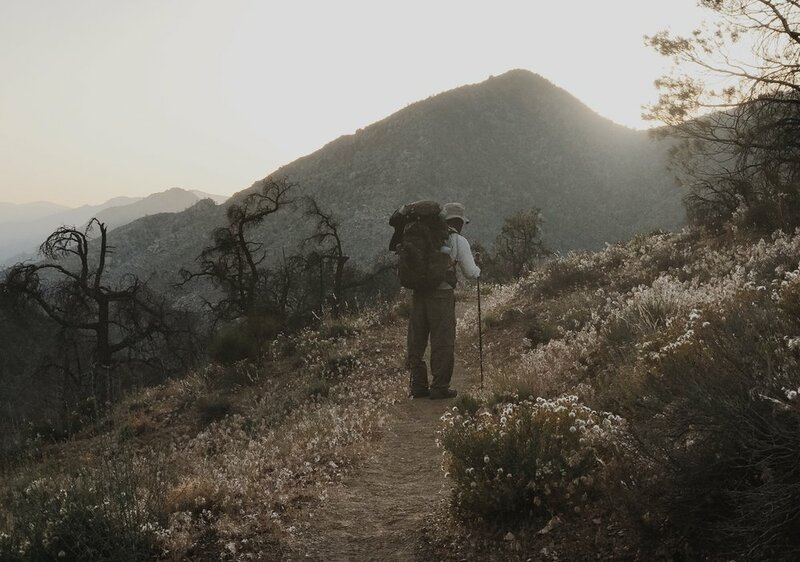 A lot of hikers take issue with the book Wild, but the fact is that Cheryl has done a lot to shed light on what Thru Hiking is and has inspired so many out there to give it a go. The stretch from Tehachapi to Lake Isabella was hot and dry. The distance between natural water sources during that stretch was nonless than 17 or 18 miles. This means that you have to plan your water intake carefully, move during the cooler hours, and carry more water than what you'd like to carry. At one point there was going to be about 45 miles between natural sources, but thanks to two water caches along the way, it wasn't as bad as it could have been. Still, it was a pretty difficult stretch of miles that I am glad I'm done with. I felt sluggish and unmotivated that week. Trail magic when you need it. Escape from the afternoon sun. When I reached Walker Pass, I hitched a ride into town to where a couple of the guys had a hotel. I had two rides, one from a fire fighter, the other from a guy who had some sort of cancer and was coming back from radiation and chemo treatment that day. Both were very nice, but I will say that hitching isn't my preferred method of transportation. It Still creeps me out a bit, but it's amazing who these nice people are who are willing to pick up a total stranger. Beautiful sights in the desert. We spent the next two days in a great little cabin owned by a gentleman from the company Pelican. He cooked us dinner both nights and took us where we needed to go. Pelican (the case company) bought all the food and Kevin provided the cabin. He was an amazing host and we wanted for nothing. It's not every day you meet a WWII vet. From Walker Pass, we had about 50 miles before the end of the 700 mile desert section of the PCT. On day two of the hike, I felt like I could hear someone coming behind me and briefly looked behind me while walking. When I looked forward again, I stepped over what I thought was a small branch in the path after catching it out of the corner of my eye. For some reason, I looked back at it and saw that the branch I stepped over wasn't a branch at all. It was a two and a half foot Rattle Snake laying across the trail. I came within inches of stepping on it and the thought of what could have happened if I did made my skin crawl. I wanted to jump out of my skin! My guess is that when I looked back behind me, he crawled out and when we saw me coming, he froze in place. The timing was perfect, but luckily is wasn't too perfect because I'm pretty sure I'd be dealing with a snake bite right now if it had been. It was by far my closest and creepiest encounter with a snake on the trail. When you have cell service, you take advantage of it. We reached 700 miles and Kennedy Meadows a day or so later. For those of you who don't know, Kennedy Meadows is the beginning of the Sierra section of the trail which is the hot topic of all hikers given the massive amounts of snow in the mountains this year. Between the decisions of what to do about the Sierra and the finishing up of 700 miles, it was a pretty heavy day. Kennedy Meadows had been a geographical mile marker for so long and we were finally there. I felt drained. So many miles travelled, yet so many more to go. And what about the plan for the Sierra? Drying out my shoes after some snow travel. I hiked the next 44 miles to the Lone pine access road in two days. The trail went from roughly 6400 ft to 10,500 ft in one day, back down to 9000 ft and back up to 10k the next day. We hit snow the first day out of Kennedy Meadows, but it was manageable. With we feet, but energy to do more miles, we decided to make camp that first night so we could make a fire and dry our shoes out. It's amazing how a fire can make everything seem better. One of the most beautiful valleys I've ever seen and hidden from the general public. So what are my plans? The Sierra Mountains are a crapshoot. Some people are getting through a pass or two then hiking 15 miles down to a trail junction or town for resupply. As of right now, the park isn't even open at higher elevations where the trail goes through and the Park Service is advising not to travel through. There is 12-15 feet of snow at the gates and the rivers are raging with water. Unless you're a snow god, it's advised that you do not attempt the passes. It's a tough decision to make, but I've decided to skip ahead to Lake Tahoe (where I'm writing this post from) and continue on to Canada. If all goes well, I'll return to Lone Pine in early September and cruise through the Sierra Mountains doing 25-30 miles a day. By that time, the snow should be mostly gone and I'll be able to wrap them up in a matter of a couple of weeks. Each individual has to make the call for themselves and for me, this is what I feel is best. Thru Hiking is about making good decisions and being smart. I'm not a mountaineer and knowing when snow is safe or unsafe is not in my skill set yet, so I'm choosing to reroute and come back later. From the looks of it, I've made a great decision and am excited to begin my 600 mile journey to the Oregon border. This hike is a journey. I'm learning to be effective and efficient and with my energy, food, and gear. I have opinions about the gear I'm carrying, some of which I'd prefer to swap out, but due to sponsorships I am unable to. For the most part I'm happy with what I have with me. Coming out of Tahoe, my goal is to do no less than 20 miles per day and no more than 25. If terrain allows, I intend to do no less than 25 in a week or two. The more miles per day I do, the less food I require. As the days get longer, 25 miles per day should be easy to do. My next milestone is Oregon. A mere 600 miles before me. What's freaky about that statement is that it doesn't scare me. It's doable and it will be completed in just a few weeks. I hike out tomorrow evening when Jess drops me off at the trail (yes, she's here in Tahoe). I am not looking forward to saying goodbye again, but I'll see her again soon. I've enjoyed this weekend so much having coffee and doing nothing together. I feel half normal so it will be strange to dawn my hiking attire and walk down that trail again. Until next time, thanks for sharing in these miles with me and go do something that makes you uncomfortable. I promise it's worth it.